Just found this awesome sleeve that I believe is made for the Honor 8 too!! So I discovered this awesome well made sleeve on Amazon. So far I've seen just about it being offered for every phone I've check so far. I've also heard and been told that this sleeve is made really good and is soft and supple leather. I don't typically use cases so if you are like I am and would rather not use a case all the time this maybe something you will like. It's offered in 16 different colors! I personally ordered two of them. I ordered the Beat Orange for my Axon 7 and the Beat Red for my new Sony Xperia X Performance I just bought which by the way I had it narrowed down to between the Sony which was their flagship device in 2016 and the Honor 8. I got such a good deal on the Sony with it having the 820 processor and it being exactly 5 inches that I decided to go for it over the beloved honor 8. Anyways the inner lining of this sleeve by FitBag is like a microfiber cloth. It's very protective for your phone and would be perfect for the honor 8 which when I do get another one I'll be ordering this sleeve for mine. The other two colors I liked was the Beat Blue and Beat Yellow but they had 16 colors overall to choose from. They aren't cheap as they run about $25 bucks a piece but give you full protection. Lately when I use a case it's been folio style cases so these sleeves were perfect for me. Here's a couple pictures of them. Mine are on the way and I believe they are hand made and they come from Germany. Here's a pic of the Beat Orange and Beat Red which the Beat Red would be the color I'd order for the Honor 8 when I get another one. They are extremely well made according to a few guys over on the Nexus 6p forum and Amazon they have 5 star reviews. They look really nice! Thanks for the heads-up! Oh no problem! I miss all you guys since got rid of my last honor 8. Check and see if that sleeve is offered for the honor 8. I'm pretty sure it is. I want to get another honor 8 so I can get back over here with you guys. Hey I appreciate that man very much. I always had a blast posting over here. It's by far my favorite forum on the site. Lots of nice people and lots of good interaction over here. I can tell you the phone I just bought there is zero post going on over there. I'm beginning to wonder just very few people even bought the phone. I got a good deal on it but it seems like I want be discussing it any lol. Hopefully I'll rejoin this club pretty soon. I keep thinking honor is going to release something new any time now which now I predict we won't see the honor 9 but I'm thinking for some reason we may end up getting the honor 8 pro only because the honor 8 is so widely known here in the US now. I'm interested to see what we get. I think it will be this year but just not seeing it be the honor 9 anymore for some reason now. I keep thinking honor is going to release something new any time now which now I predict we won't see the honor 9 but I'm thinking for some reason we may end up getting the honor 8 pro only because the honor 8 is so widely known here in the US now. I'm interested to see what we get. I think it will be this year but just not seeing it be the honor 9 anymore for some reason now. I think the most likely candidate for release in the US is the 7x at this point. I feel like they are going to change there strategy and become a strait up mid-range phone company here in the states. Hmm... 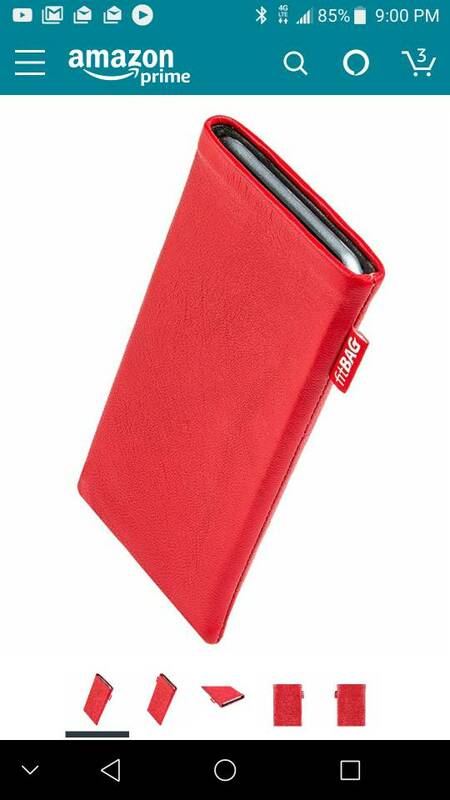 This is one of the few times I've seen sleeves like this for smartphones - what advantage do they have over a fabric case? Can you post a link to the honor 8 one? Took a bit to find em. There are a lot of ones for the honor 8 pro and 8 lite. After scrolling for awhile I finally found some the the honor 8. Yeah, I'm a case man myself but these look very tempting. I can see picking up on of these for the few times I go "naked". I like the grey the best. It'd be great to have you back! And thanks for the sleeve recommendation! Those do look nice! What would be nice is a sleeve that works with a case. But of course there are so many case variations that it would be kind of difficult. I believe I've got a couple for my Sony made by orizlly that are like skins they are so thin. I plan to use them with the sleeve. I've also got a few of these paper thin cases for an iPhone 6s which I might end up buying again just because I have over 20 cases for it. That spans from the iPhone 6 release bc both models fit the same case. Ive got a ton of cases sitting in a drawer from over the years. I used to collect cases. If I found one I liked I always bought it. Lol. I have got way too many. I'm hoping the Sony cases I already have will fit my new Sony too. Both models I had are very similar so I've heard my X cases will fit my X Performance model but will be just a little snug. I love peel cases! Sadly I think that ship has sailed for an honor 8 peel case. Thanks for this, I'm a sleeve guy whenever I use a slim case. I have several but this one has a unique design. I may get it for my note 8. Here's the thin case I'm talking about. It's so thin that it offers full protection but zero bulk. It's almost like a skin. This is who makes it. I'm not sure if they make one for the Honor 8 or not but if they do when I get my next Pearl color honor 8 I'll be getting one of these for it. By the way guys I've changed my mind about the honor 9 whether or not if the US will see it or not. Now my prediction has changed. I now think that we in fact will not see the honor 9 but instead we will get the honor 8 pro to be released here in the US. It just makes better since for Huawei as the honor 8 is already widely known here in the US so the logical thing to do is add on to the honor 8 name and release the pro version of it here. I'd rather we see the honor 9 but now I'm thinking we won't but we'll see the honor 8 pro. Thoughts on this prediction anyone? Glad you found it on here then. It's a really well made sleeve and I've got a couple of very thin cases that will work with the sleeve on my Sony Xperia X Performance. I just posted the type of case that will work with it. You might try and locate that same case for your note 8 as it's skin type thin but still offers full protection. Check my post previous to this one for a picture of it. By the way what color sleeve will you get? They offer 16 colors. I've got both the Beat Red and the Beat Orange incoming for my two phones. I tend to stick with black or dark gray. Matches the phone. They've definitely got both colors then I believe. Just check and make sure they make it for the note 8 which I would have to think they do. How's well does this case protect against bumps and small drops? It looks great but I'd be worried if I ever dropped it. I really think the 7x will be the next phone we see here in the US. I think the honor 6x sold better than the honor 8. I would guess that they may drop selling the "upper mid-range" phones and focus on "mid-range" here in the states. I hope I'm wrong though! That's a very good point but I'm hoping honor will keep some type of upper end mid range precense here in the US. I don't know why I think it will be the honor 8 pro and yes I definitely agree with you about the 7x that we will see it too. The 6x did well also but the honor 8 when it went on sale seemed to steal the show. I think bc the honor 8 name is already so widely known that they will stay with that name theme and offer the 8 pro for some reason. I too could be totally off or wrong. Oh the case does well against drops and bumps. It's got full coverage and is s tough type material although thin. I would feel totally okay dropping it on pavement and not getting a scratch but what you don't get is shock absorber type action. So you kiss that but you get full protection. It'll be my main case I use for my new Sony Xperia X Performance. I've got here waiting on my Sony to drop this morning. Here's the sleeve I have coming for my Axon 7 Mini. I got it in Beat Orange. It looks pretty killer. I think one of these would go great with a Honor 8 though. I'd order a Beat Red if I had an honor 8 right now for it. These are supposed to be extremely well made and the leather very soft and supple. I've actually spoken with a few guys over on the Nexus 6p forum who ordered some of these sleeves and they said they were awesome. Then they have 5 stars review on Amazon. FitBag is the name if you look for your model phone on Amazon. I believe they make a sleeve for just about every popular phone. Here's the Beat Orange I have incoming for my Axon. Upgrade for Note 4 on Verizon: "One Year" Phone or which flagship?? Why is my phone suddenly hangs and then it shut off?